Argentine midfielder moves to French champions in a deal worth an estimated 47 million euros. 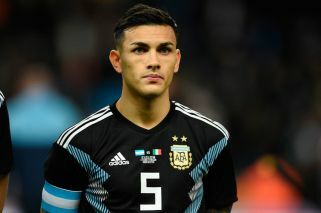 Paris Saint-Germain have completed the signing of Argentine international Leandro Paredes from Zenit Saint Petersburg on a four-and-a-half-year deal, the French champions have confirmed. The 25-year-old midfielder put pen to paper on a contract until 2023 after completing a medical in Qatar. No transfer fee was disclosed, although press reports have put the fee at 47 million euros (US$54 million). "Leandro's arrival will keep the momentum, both on the pitch and among our supporters, ahead of the major events coming up. Exciting times lie ahead," PSG's Qatari president Nasser al-Khelaifi said in a club statement. "After my previous experiences in Italy and Russia, I now have this fantastic opportunity, not only to discover a new league, but above all one to wear one the most prestigious club jerseys in the world," said Paredes, who will team up with compatriot Ángel di María at the Parc des Princes. The Ligue 1 leaders were looking to strengthen in midfield ahead of their Champions League last-16 tie against Manchester United, with Marco Verratti sidelined with an ankle injury and Adrien Rabiot frozen out after refusing to sign a new contract. PSG go to Old Trafford for the first leg of that tie on February 12, and they are currently sweating on the fitness of Neymar, who suffered a metatarsal injury last week. Paredes, who has won nine caps but was not part of Argentina's squad at last year's World Cup, has previously played for Boca Juniors and Roma. He moved to Zenit in 2017. PSG may still look to add another midfielder before the January transfer window closes, having already had an offer rejected for Idrissa Gueye of Everton. British Sky Sports reported late on Monday that the Senegal international, who used to play for Lille, had handed in a transfer request to try to force through a move back to France.